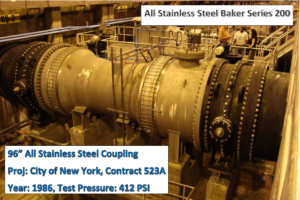 For when large diameter (over 217”) couplings are needed, segmented couplings are designed and manufactured. 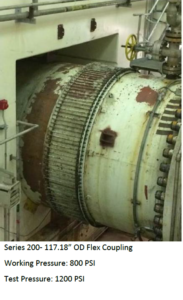 Baker Segmented Couplings allow for ease of disassembly as well as having interchangeable parts in maintenance and part substitution. 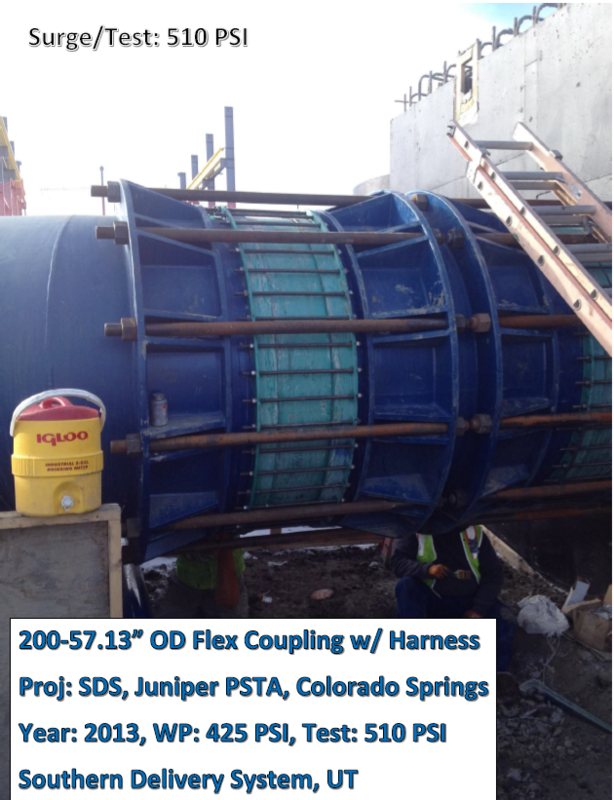 These large couplings are made possible by fabricating the middle ring in segments. 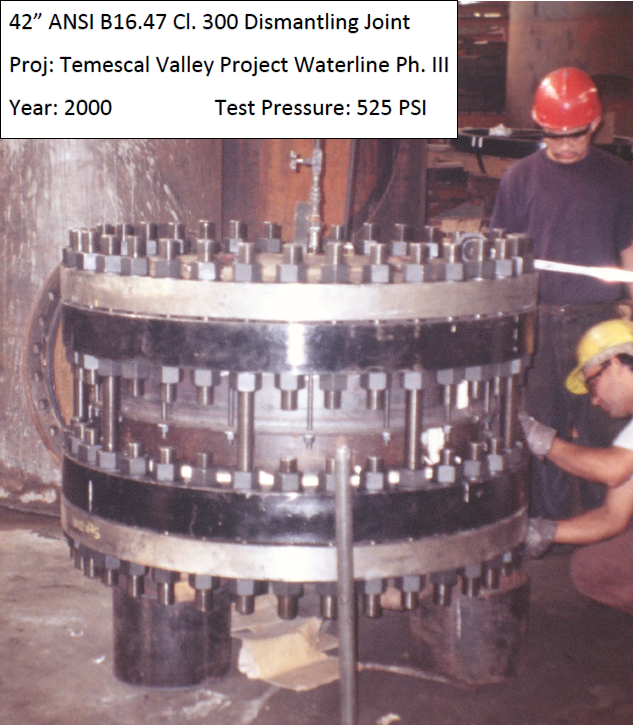 The segments are match marked for field welding in order to produce a complete coupling.The segmented follower rings can be furnished from ASTM A36, but other materials can be used per specification. 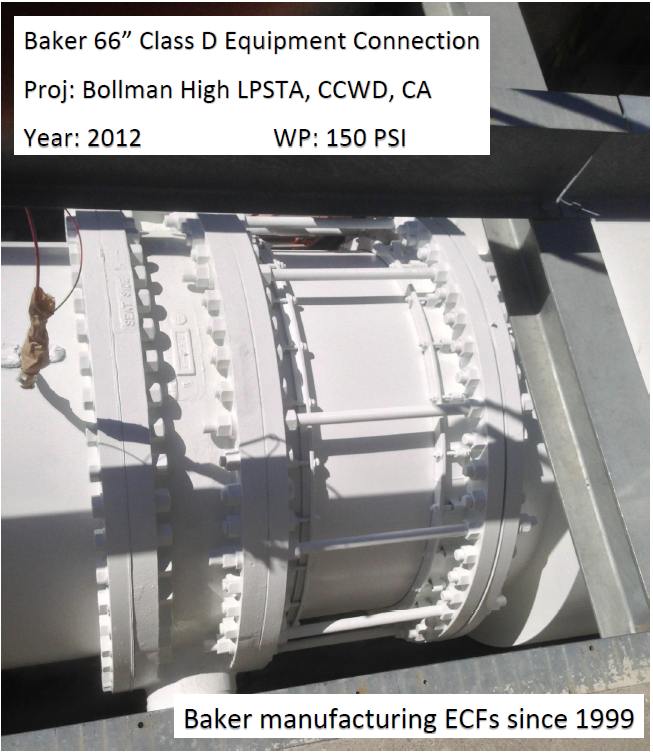 Hardware can be supplied with ASTM A563, or per spec. Bolts are equally spaced along the circumference to provide uniform and adjust gasket pressure in response to future settlement and rebound. 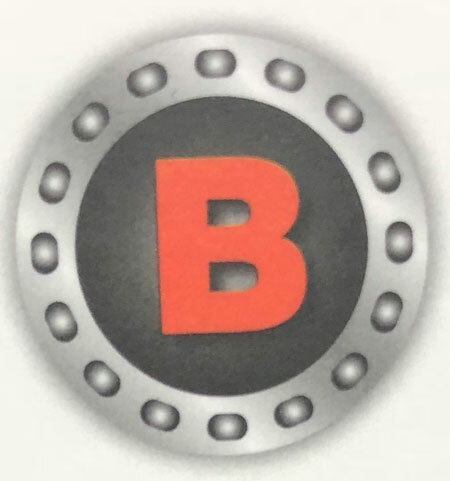 For extra flexibility each segment lug contains only one bolt and is one piece that transfers the bolt pressure directly to the gasket. 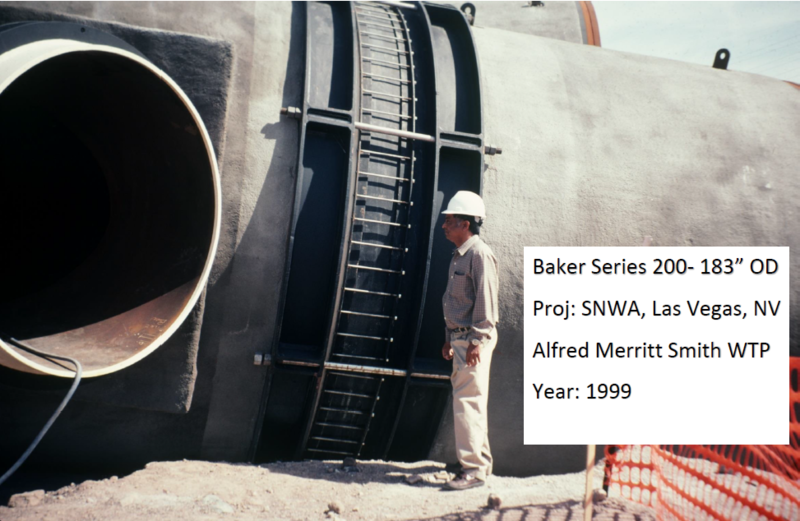 Baker Segmented Couplings provide pipe movement of 1-½” expansion-contraction, and are subject to great settlement and rebound. 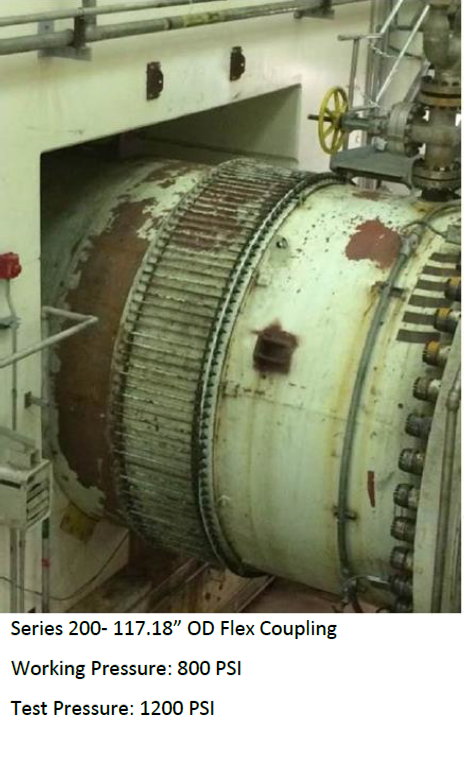 Note to Design Engineer: Axial bolts to squeeze the circumferential gasket is not recommended. Segmented Coupling of 299.25” through 170.00” O.D. Segmented Couplings of 337.4” through 336.4” O.D. 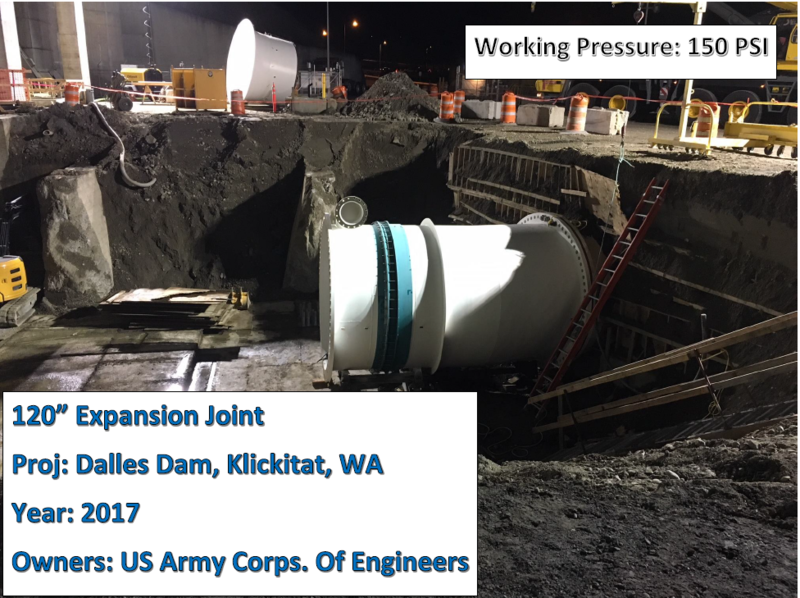 Owners: U.S. Army Corps of Engineers, Penstocks 291” O.D. 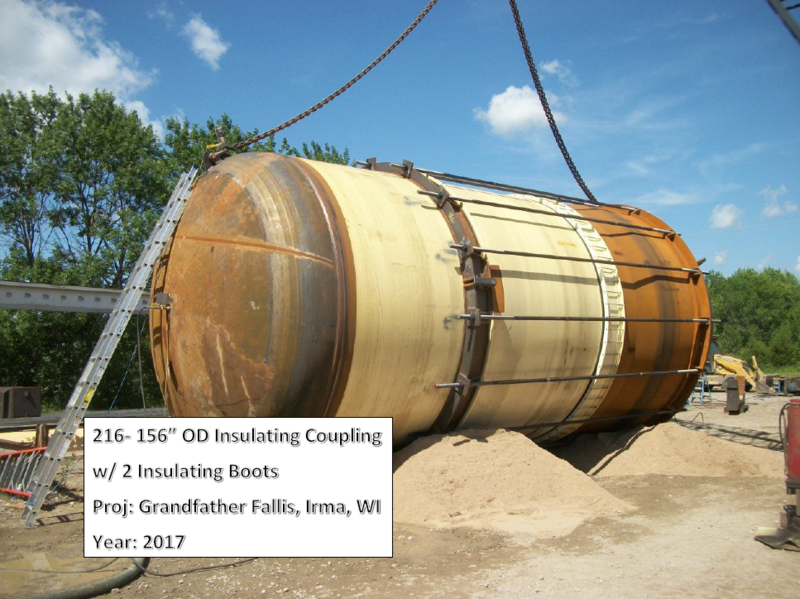 Tested simultaneously to 150 PSI and ½ deg. 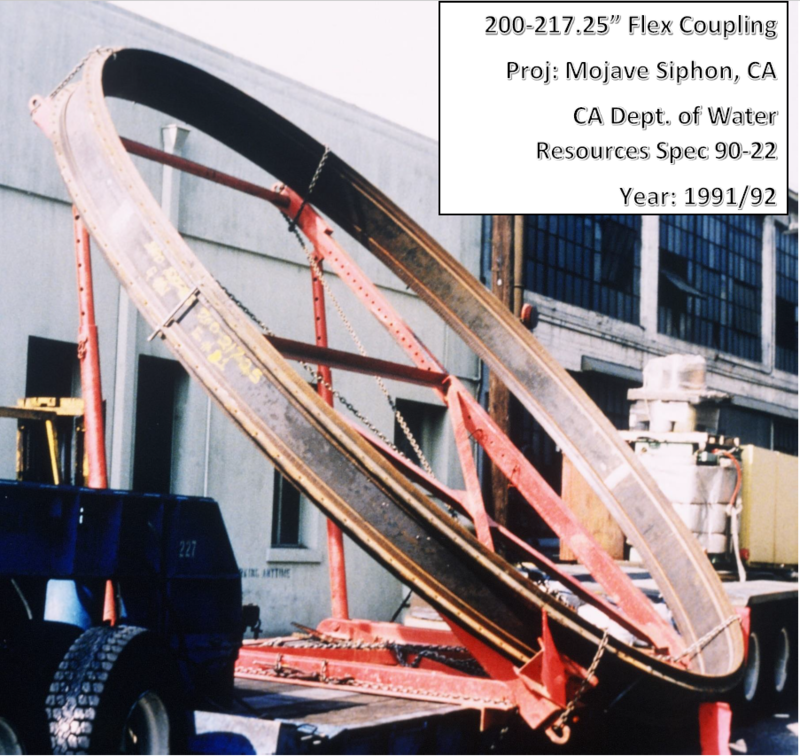 of articulation, and pipe movements of 1-½ expansion-contraction. Owners: Hydro-Quebec,Segmented Couplings of 248.13” O.D. 152 PSI design pressure. 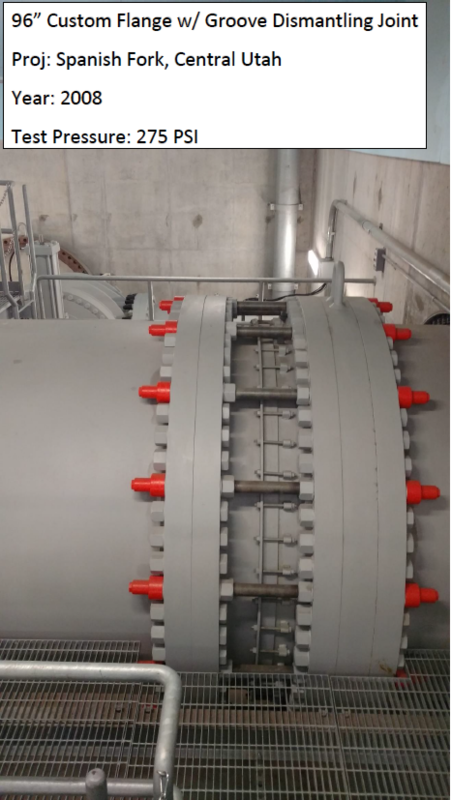 Middle rings of Stelco 44, Gr. 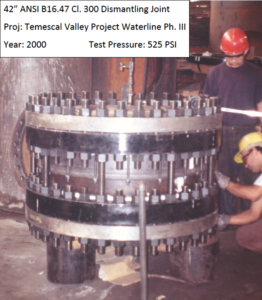 B.
Penstocks of 23.6 foot O.D., for 60 PSI working pressure. 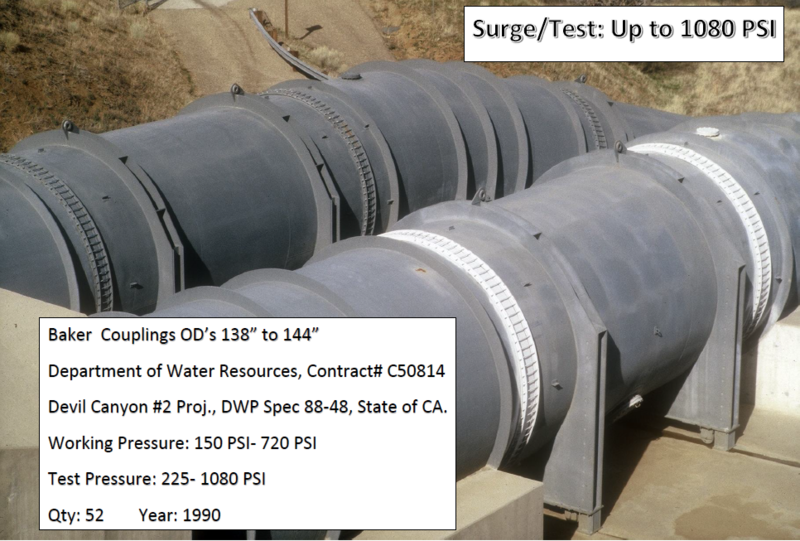 Provide articulation of pipeline adjacent the huge surge tank, one of the largest structures on the California Water Project. 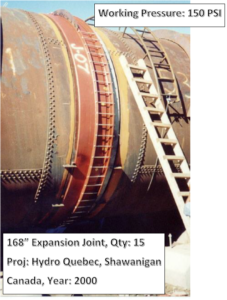 Other couplings for 169.50” O.D. 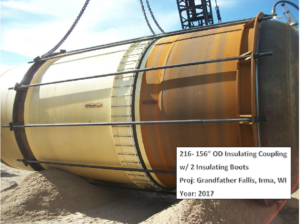 (210 PSI) and 61” O.D. 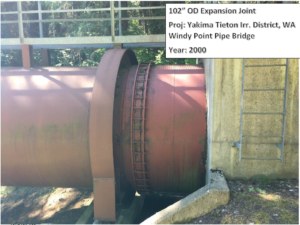 Segmented Coupling of 177.13” O.D. 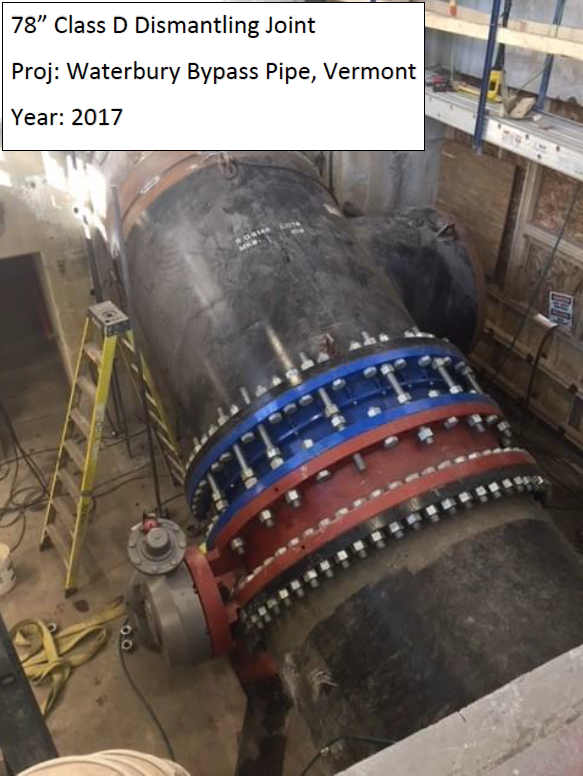 Segmented Coupling of 326.43” O.D., refurbished after over 35 years of service. 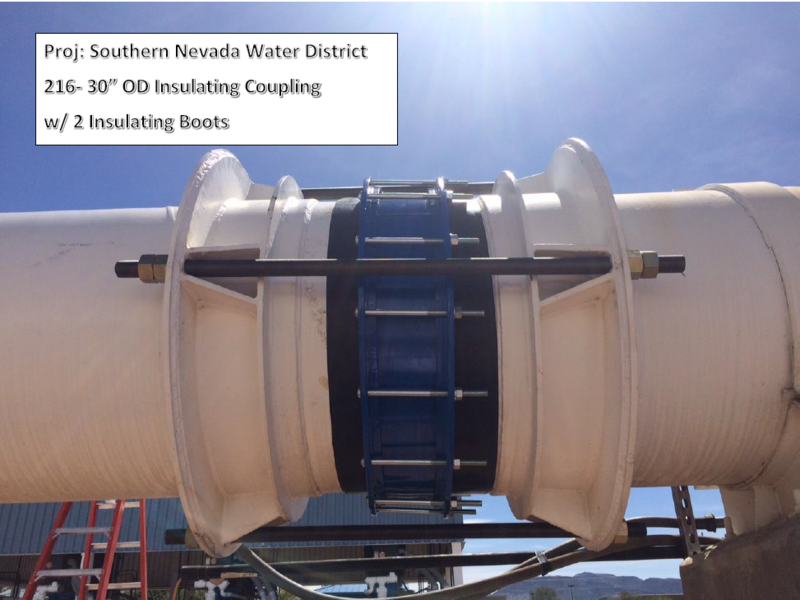 Baker Flex Couplings are used to provide a flexible connection between two plain end pipes with the same pipe OD. Couplings meet or exceed provisions of ANSI/AWWA C219 (Couplings standard for plain end pipe). Alternate materials and coatings can be provided as required by project specifications. Contact Baker. Sizing information (linked below) is for commonly used pipe sizes and pressures. Contact Baker for design of sizes not shown. All dimensions are in inches. Flexible couplings do not provide against pull out of pipe. 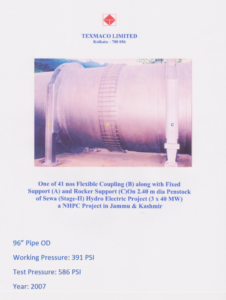 Pipe stops, and anchor pins can be provided if required. 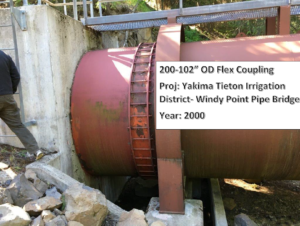 Suitable anchorage may be required to prevent pull out of pipe. Also available with Viton and Neoprene Gaskets. 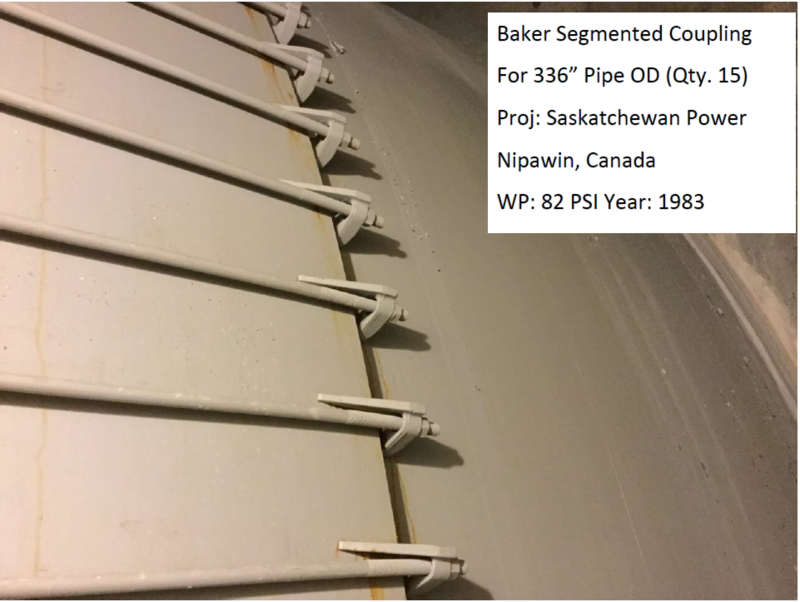 Baker Series 208 are used to provide a flexible connection between two plain end pipes with large pipe gap. Baker Series 216 Insulating Couplings are used to provide a flexible connection between two plain end pipe, while providing electrolytic isolation. Baker Series 212 Transition Couplings are used to provide a flexible connection between two plain end pipes with the same nominal pipe size. 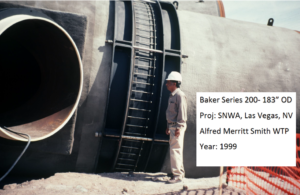 Baker Series 220 Reducing Couplings are used to provide a flexible connection between two plain end pipes with different nominal pipe sizes. 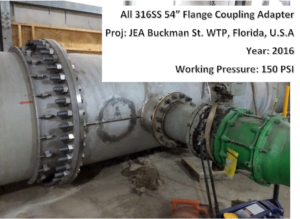 Baker Flange Coupling Adapters (FCA) are used to provide a flexible connection between plain end pipe and flanged end connection. 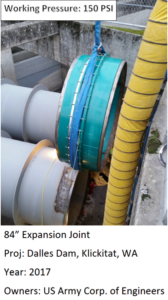 Baker Flange Coupling Adapters (FCA) are used to provide a flexible connection between plain end pipe and flanged end connection with different pipe sizes. 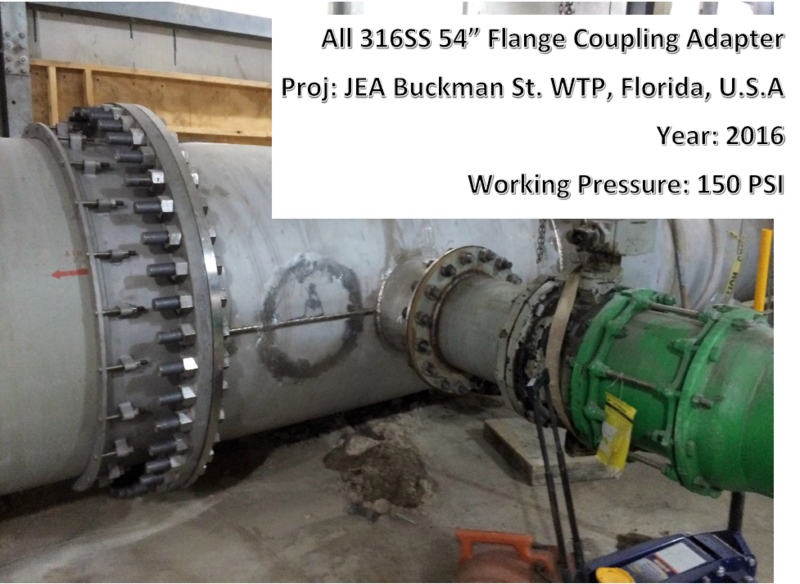 The Baker Dismantling Joint is a double-flanged pipe fitting. 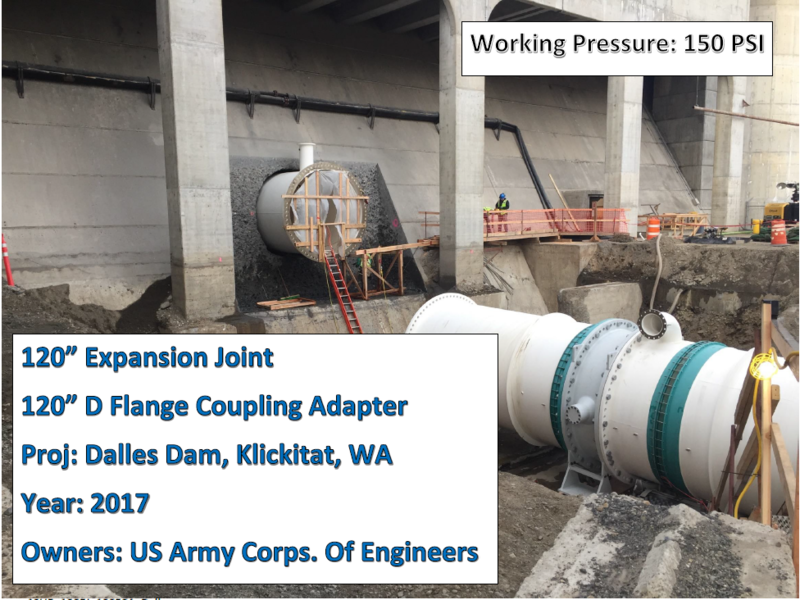 Dismantling Joints allow for easy installation and continued maintenance of the fitting. 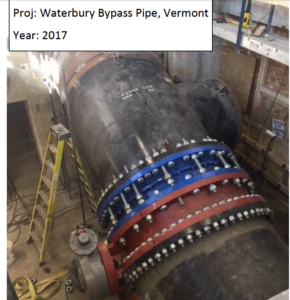 Typical applications include pumping stations, water treatment works, sewage treatment works, plant rooms, meter chambers, power generation equipment and gas distribution stations. 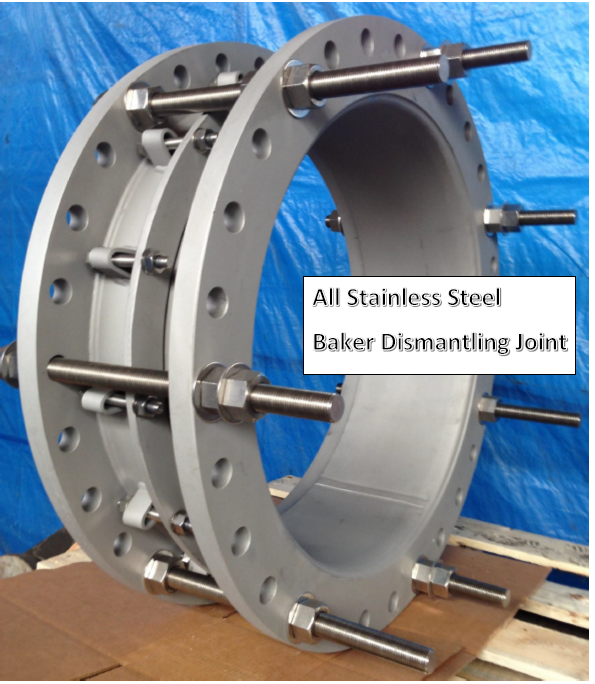 Baker Dismantling Joints can accommodate custom longitudinal adjustment dependent on the diameter and allows for up to 1-.5-3.5° of misalignment. Once adjusted the Dismantling joints movement can be restricted by using the supplied tie rods. The Dismantling Joints are designed such that the restraint system does not extend outside of the flange diameter. Baker Dismantling Joints can be easily installed with minimal special equipment needed. Dismantling Joints can be made with any nominal size, with common flange drillings to mate with AWWA C207 Class D, E, and F flanges with a working pressure of 150 PSI and higher. 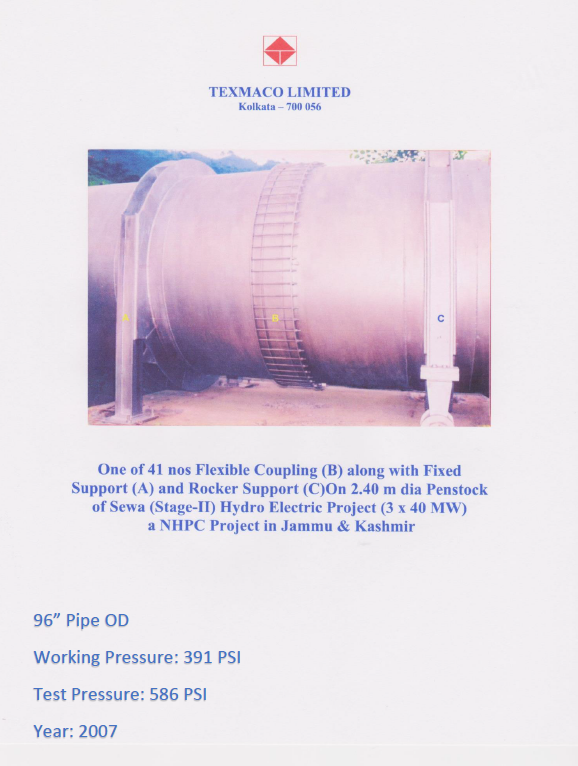 Specials can be made based on specific project requirements. 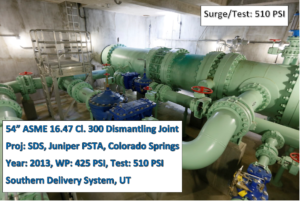 Dismantling Joints are shipped with SBR gaskets but can be changed based on different applications. 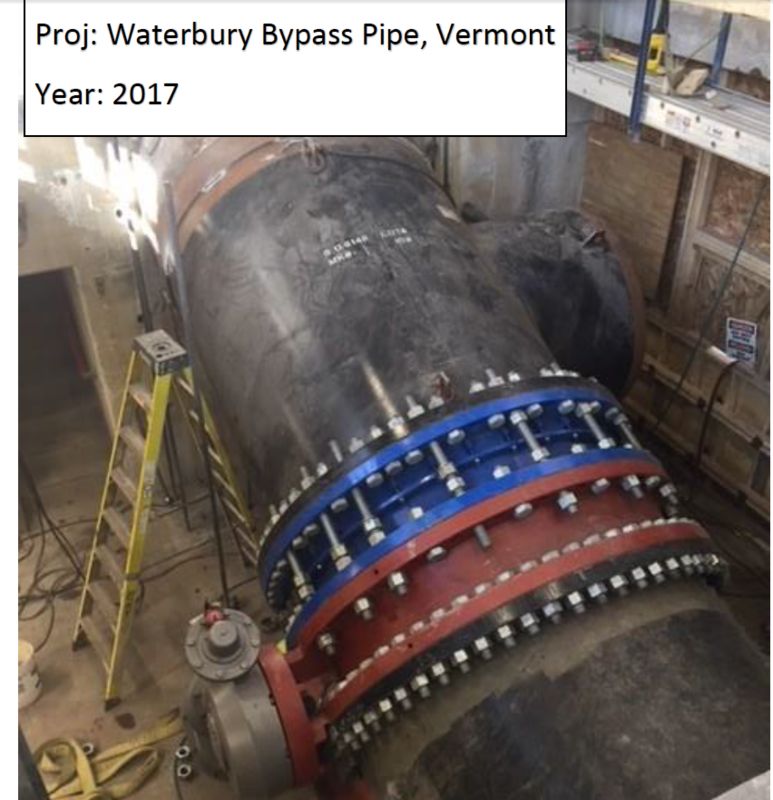 Baker Dismantling Joint is a double-flanged pipe fitting. Dismantling Joints allow for easy installation and continued maintenance of the fitting. Dismantling Joints shall be manufactured in the USA. 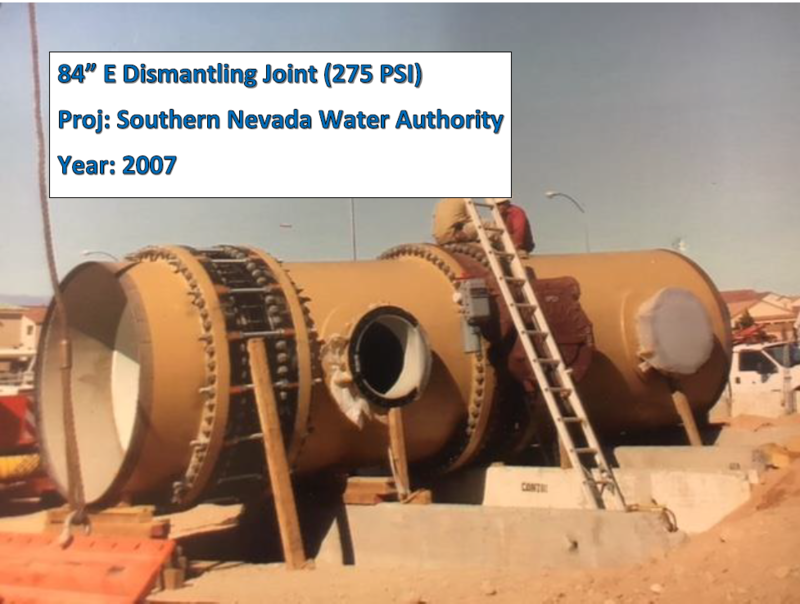 Dismantling Joints shall meet or exceed provisions of ANSI/AWWA C219. Alternate materials and coatings can be provided as required by project specifications. 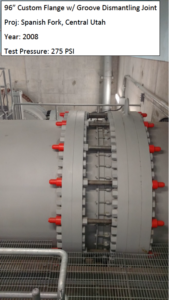 Designed so that no part of the restraint system extends beyond the flange diameter. 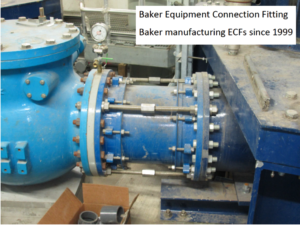 Baker Equipment Connection Fittings combine two flange couplings with a spool piece to provide restraint for misaligned flanged fittings. 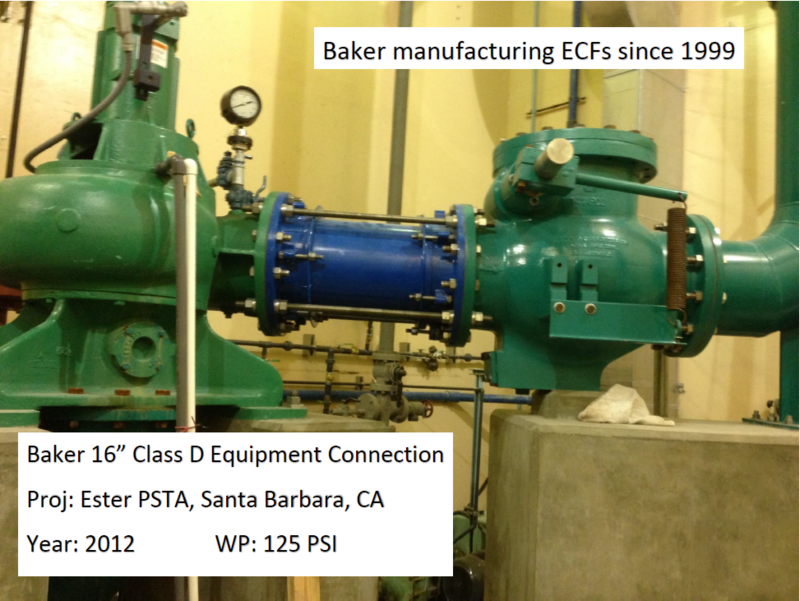 Baker ECFs are capable of accommodating a minimum of ¼” offset and 1-2° deflection. Like Baker Dismantling Joints, Equipment Connections have an adjustable laying length to allow for the ease of installation of external components. Tie rods provide a means of restraining the joint and are easily installed or removed. Baker ECFs are compatible with various flange types, including AWWA C207 Cl. D, Cl. E, and Cl. 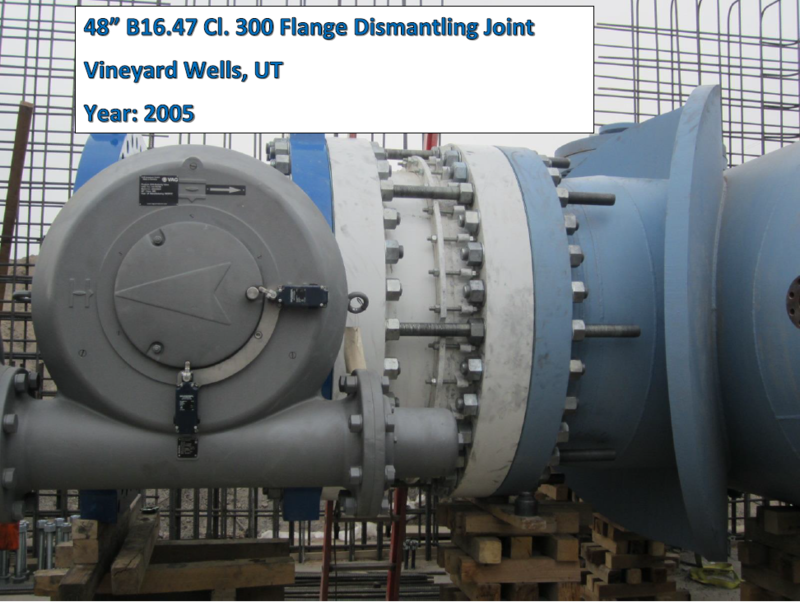 F flanges. 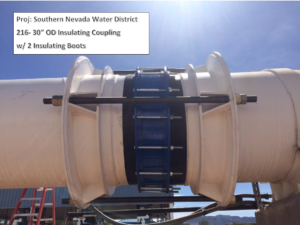 The laying length of the equipment connection can be made to accommodate the span between pipe fittings. ECF come with standard hardware, but also available with stainless steel. 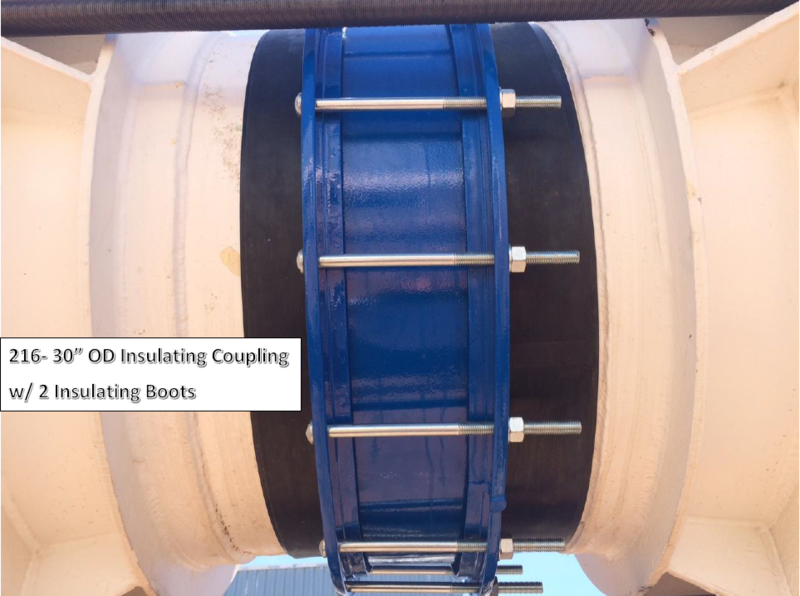 Baker Equipment Connection Fittings combine two flange couplings with a spool piece to provide restraint for misaligned flanged fittings. 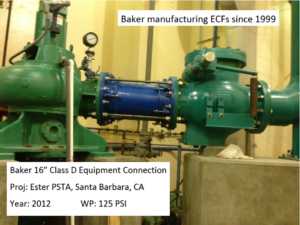 ECFs shall be manufactured in the USA. 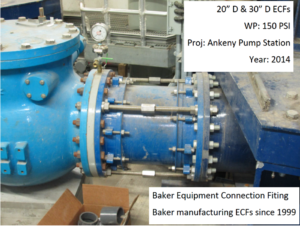 ECFs shall meet or exceed provisions of ANSI/AWWA C219. Baker Series 401 Expansion Joints are used to provide connection between plain end pipe where there is a large concentrated movement. 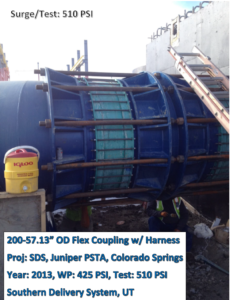 Couplings meet or exceed provisions of ANSI/AWWA C221 (Standard for Fabricated Steel Slip-Type Expansion Joints). Hard Chrome plated on machined surface or stainless-steel option. 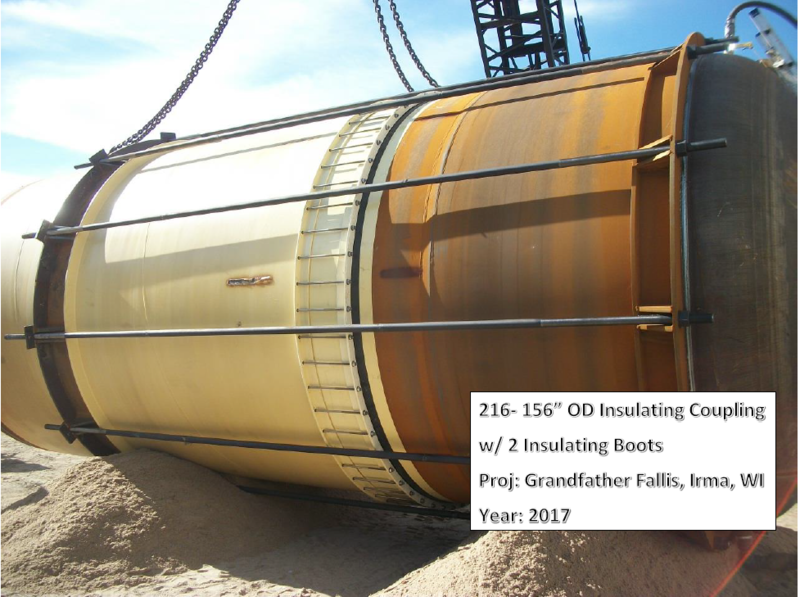 Alternating combination of rubber and impregnated flax for water service. Other packing material available upon request. 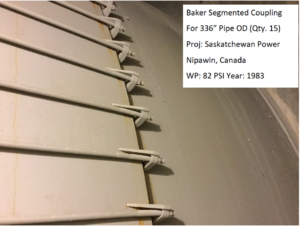 Baker Series 403 Expansion Joints are used to provide connection between plain end pipe where there is a large concentrated movement and multiple expansion joints are used in series.